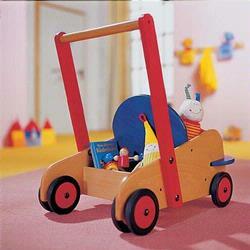 Made of solid wood, this finely crafted walker is sturdy enough to hold a passenger -- whether real or pretend -- in the roomy seat, with a back storage area for toys. Wide and stable with just the right amount of resistance, it's perfect for beginning walkers. It is designed in Germany with an exceptional standard of craftsmanship, and is sure to stand up to generations of play.